In this paper, we investigate the necessity of personal income tax reform of individual persons. The critical analysis of the main arguments toward a single tax rate is based on the empirical data. In a result of current research it is found that despite an increase in tax revenues the role of tax in the consolidated budget of a country is low and it does not justify its fiscal importance. The growth in monetary income and simplification of procedures of tax management does not contribute to differentiation in revenues and their legalization has still remains unchanged. It was concluded that the single tax rate keeps a stable inflow of tax receipts to the state budget, however, it does not provide realization with the principle of equity of taxation to the full extent. These circumstances give grounds to a gradual return to assessment scale in taxation to provide extra revenues for the government budget and reduce tax pressure on social strata. The necessity of search for additional reserves for the growth in revenue side of the state budget has been frequently discussed lately. It is suggested to impose tax on unemployed citizens, childless citizens, to restrict trip abroad to the self-employed and many other strange offers which do not resolve overall the problem of low budget. Although, we must admit that the need for progressive taxation is increasingly under discussion. Nevertheless, the Government does not want to notice this problem which is still existing. It should be recalled, that in 2001 the fiscal reform of revenues of individuals was that to cancel progressive scale, to establish a single flat rate at the level 13%, to reduce benefits and to simplify the procedure of payment and collection taxes. A significant increase in revenues of the state budget occurred through improving collection of individual tax income. A significance of tax on natural person increased in the budget system. Legalization of a part of revenues in high-income groups of the population was reached resulting in increase in justification of taxation . Now we consider fairness and credibility of the above statements. In justifying the given results of the reform, it is resorted some «tricks» in order to demonstrate the superiority of flat income tax scale for individuals. For instance, the analysis is employed a limited time interval (at best from 2000 to 2005 years, at worst, in order to compare an interval from 2000 to 2001 is taken), omit important tendencies contradicting «superiority» of progressive scale, for example, about deepening differentiation incomes and etc. In our research, we used the data taken from Russian Federal State Statistics Service (also known as Rosstat) , so the obtained results are easy to check. The time range with which the analysis was undertaken involve several years from 2000 to 2016. 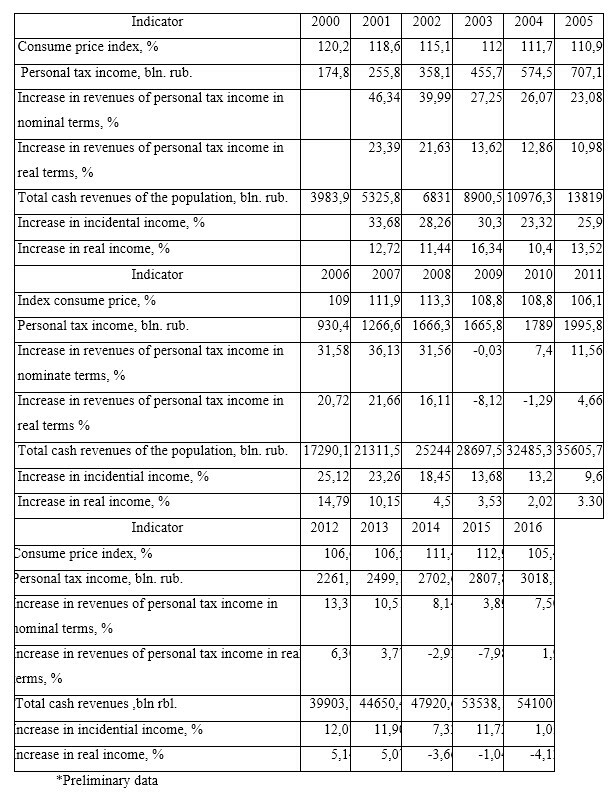 In favor of the first argument, leaded by the authorities, it is demonstrated how tax revenues are changed according to personal income tax comparing to the population income (Table 1). It can be done using both real and nominal figures. As we can see from Table 1, in 2001-2002 tax revenues growth rates are significantly higher than growth rates in real income of the population. In subsequent years, effect of the tax reform, in theory, might decrease, so the rate of growth in income and tax revenues apparently might be close. However, in fact there is a contradiction. In 2004, 2006, 2007-2008, 2011-2012 real growth rates in tax revenues from individual tax income exceeded real growth rates in income as well. Moreover, in 2007-2008 the excess was considerably higher than it was « as a result of the reform»! But in 2003, 2005, 2009, 2010, 2013 and 2015 the situation reversed, the real growth rates in income were higher than real growth rates in tax revenues from personal tax income. The latter was explained by the introduction of different benefits, improving standards of deduction and other changes. Nevertheless, it is obvious that certain factors influenced on dynamics of revenues from individual tax income instead of a reduction in tax rates. Figure 1 and Figure 2 depict it clearly. As it can be shown from these pictures, dynamics of revenues from individual tax income are much closer to dynamics of wage (taken from the balance of money income Rosstat ), than to dynamics of aggregate cash revenues. Thus we should not definitely connect the growth in revenues from individual tax income with the tax reform. The most important factor impacted on dynamics of tax revenues is growth in wage. 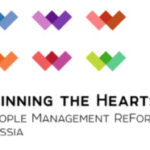 Next let us consider justification of the second statement of supporters flat scale tax – relatively to significant increase in personal tax income in the Russian budget system. It is a common fact, that in well developed countries with market economy tax income provides the greatest revenues for budgets. For instance, in the USA approximately 45 % revenues of public account is accumulated through tax income (according to 2008-2010 years.). In such countries as Australia, Belgium, the UK, Germany, Canada, Finland, Sweden, this proportion is a third and bigger than all inflows to the national budget. 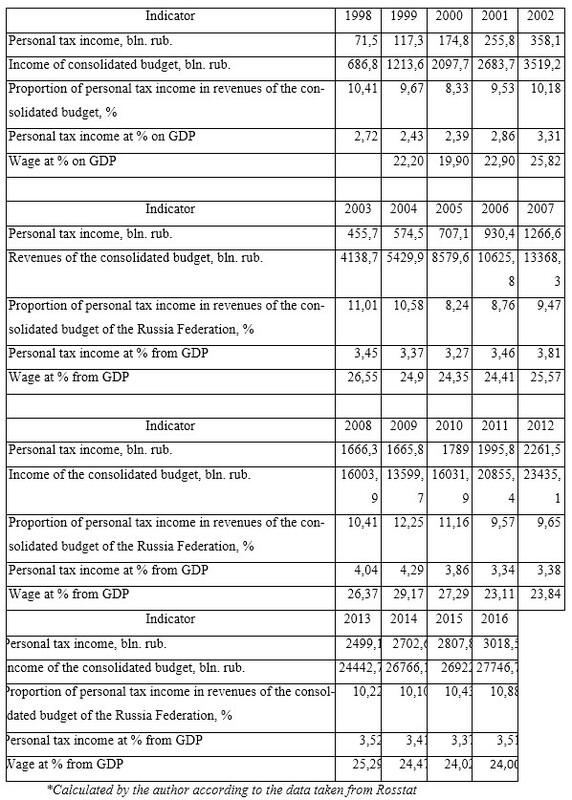 In Russia the role of personal income taxation in the build-up of incomes for the government budget is insignificant (Table 3). As can be seen, there is no noticeable increase in proportion of tax income in the consolidated budget. 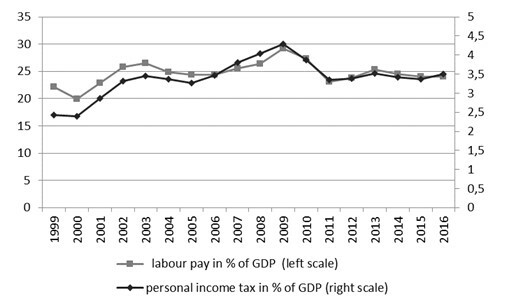 Although, a slight increase in tax income in GDP was observed after all, but it had a lot to do with increase in share of wage to GDP (Figure 3). Thus, it could be not definitely said on improving tax income in the Russian budget by introducing flat scale. Increase in proportion of individual tax income to GDP of the country mainly relates to growth in share of wage, but not to the results of the tax reform. 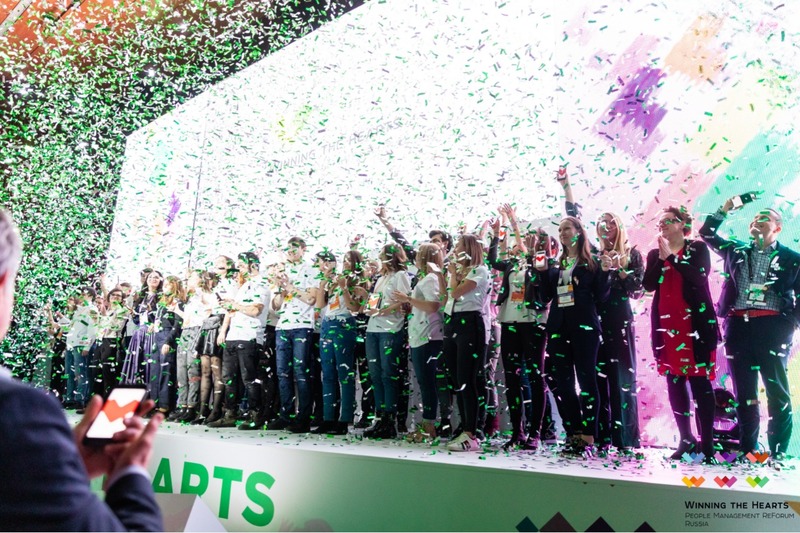 The third argument might be the most controversial for flat scale based on the assumption that legalization of part of revenues was reached in the high-income groups among the population and, as a consequence, the rise in impartiality in taxation was achieved. However, how can income taxation be fair, if the differentiation of revenues has been increasing? The level of income legalization can be assessed through the hidden wage in the aggregate amount of wage. Hidden (unofficial) earnings are a part of wage paid in nontaxable forms. Here are some examples of this: earnings from money proceeds without payroll registration, compensation in a form of financial assistance, loans, payment from insurance system, payment from deposit accounts in banks, in natural form when buying property for employers, non-expendable items and etc. (hidden wage is calculated using balance sheet approach as a difference between cash expenses and savings of population and official earnings ). The database of Rosstat possesses the information about pay levels of the population (including hidden earnings), and official wage of employees (obtained from balance of cash income and expenses of the population). The difference between them constitutes the hidden wage. Thus, dynamics of hidden earnings proportion can be viewed in aggregate cash income and wages since 1999 (Figure 4). Figure 4 clearly illustrates that during the reporting period the proportion of the hidden wage does not fall below 35% of wage (or 24% of revenues). Meanwhile, an increase in the shadow wage is found in the crisis years (1999, 2009 and 2015), then it stabilizes over the other years. Nevertheless, the tax reform of 2001 has not led to any noticeable improvements in the environment of income legalization. In spite of certain reductions in the proportion of the shadow wage in 2002, the given trend rapidly reversed and it reached its 15-year maximum, which is roughly equal to 43% (of wage) and 28% (of income) by 2015. To sum up, it is completely unreasonable to discuss legalization of income as result of the reform. 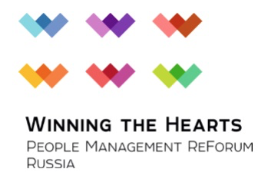 It is obvious, that nowadays revenues of the Russians are unequally distributed resulting in about 20% population, belonging to the fifth – the richest group is paid approximately 47%, meanwhile 40% of the population from the forth and the fifth groups with the highest income are paid 70% of all income. In its turn, introduction of the flat scale even worsened more the situation in this domain (Figure 5). 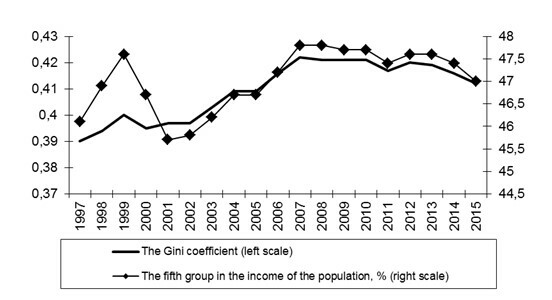 As Figure 5 shows in recent years the differentiation of revenues still remains at the high level. Furthermore, income of the fifth, the richest group of the population is growing significantly just after the reform of individual tax income. Eventually, the principle arguments of supporters for the flat scale of the tax contradict to dynamics of the macroeconomic indicators. In relation to the above, the transition to the progressive scale is still needed (but certainly with fewer taxable frameworks as compared to the Russian previous ones). 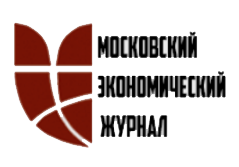 It is worth emphasizing that the ranges of taxable frameworks in individual tax income must be attached not to absolute figures of revenues, as occurred in Russia and it is currently happening in the world, but to the size of minimum and rational consumption budget (correspondingly MCB and RCB) . It resolves a problem called «social consensus»  at the rate, at which progression must begin. Sadkov V.G., Grekov I.E. On the relationships between wage, economy monetization and the state budget: the need to reform// Society and economy. – 2010.– №11-12.